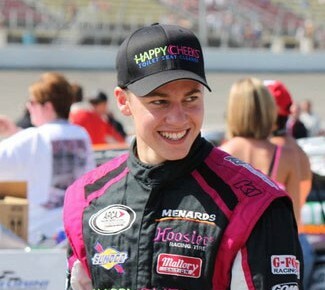 Mason Mitchell, is the young man who currently sits on top of a closely contested points battle in the ARCA Series powered by Menards. The ARCA series is a professional stock car association who pretty much run an older style car, little bit shorter races and even some tracks the NASCAR circuit does not travel to. However, even though the two series are not affiliated they do drive at some of the same tracks throughout their respective seasons, and is even considered to be a valid farm system to the Cup series much like the Camping World Truck series and the NATIONWIDE series is. I had the honor to speak with Mr. Mitchell after what was ended up being an incredible finish to the Federated Car Care ARCA Fall Classic presented by JayC Food Stores at Salem Speedway. Mitchell would finish the race in the second position behind Hessert crossing the finish like rolling backwards. Click the link here to watch the closing laps in that race. The Weekly Racer: Again thank you so much for taking some time away from your schedule to take this interview. So just above us I have posted a link to the final laps from the Salem race that saw you come across the stripe backwards, tell us a little bit about that. Mason Mitchell: Yea it was definitely an excitement filled race there at the end. We had a really good car, a dominating car. We lead I think 127 laps, at one point we had the whole field a lap or two down. If it was going to go green we were going to be sitting really pretty. But it all worked out, ended up second in a good battle, gained some more points going into Kentucky. TWR: Currently holding onto a fifty point lead over Grant Enfinger going into the second to last race of the season out in Kentucky, can you tell us what the game plan is there? MM: We are just going to try to have another good weekend and hopefully we can gain some more points. Hopefully battle there for the win, I feel really confident in our intermediate program this year and that’s what the final two races are, I really enjoy Kentucky and Kansas. They both have their different challenged but I am looking forward to it, and looking to compete for victory lane.